Gender and gastric acid have been suggested to be independently involved in the pathophysiology of functional dyspepsia, but the interrelationship among gender, dyspeptic symptoms, and gastric acid secretion remains to be evaluated. We sought to explore this issue in dyspeptic patients. A total of 89 outpatients (male, 36; mean age, 55.6 years) with dyspeptic symptoms were analyzed. The degree of dyspeptic symptoms was evaluated and scored using a symptom questionnaire consisting of 3 subcategories: dysmotility-related symptoms, reflux-related symptoms, and epigastric pain-related symptoms. Stimulated gastric acid secretion was directly measured using an endoscopic gastrin test. The total symptom scores and the epigastric pain-related symptom scores were significantly higher in female patients than in male patients. The dysmotility-related and reflux-related symptom scores were also higher, but not significantly, in the female patients. 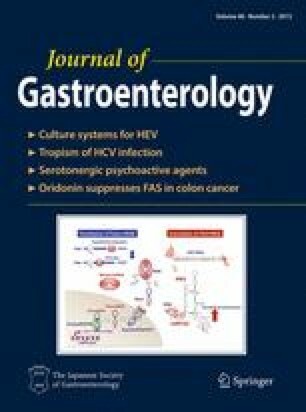 Multiple regression analysis of age, gender, habitual drinking, smoking, Helicobacter pylori infection, and gastric acid secretion revealed that gender and gastric hypochlorhydria, defined as less than 2.1 mEq/10 min in the endoscopic gastrin test, were significantly associated with higher dyspeptic symptom scores. The total scores and the dysmotility-related scores were significantly higher in the patients with gastric hypochlorhydria than in those with gastric non-hypochlorhydria, and this difference was found to be present only in females. Gastric hypochlorhydria in female dyspeptic patients may be involved in the exacerbation of dyspeptic symptoms. Differences in the responsiveness to gastric hypochlorhydria between males and females may be partly responsible for the gender differences in the prevalence and severity of dyspeptic symptoms.